This is the final block in the Windsong round robin. Cher choose such wonderful peachy colors and I tried to stay within that color range. I added some seam variation that I then beaded, a bit of a buton trail, a "fan" made out of an earring finding and a beaded cabbage rose with beaded fly stitch leaves and beaded feather stitched greenery! Enjoy! 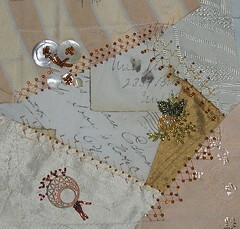 This is another block that I stitched on for Jo in the Tradewinds round robin. I wound up being a "stitch angel"! LOL!!! On this one I tried to give her more of a flavor of Colorado. There is a small mountain scene on the upper left wit a beaded reflection of the sunset. I put some lilac and Colorado columbine in the lower right corner, a pinyon pine tree in the center and a pine cone and needles off to the right. The seam treatments are varied , but pretty much my standard. One day i'll get caught up enough to go back and do some exploration with TAST! 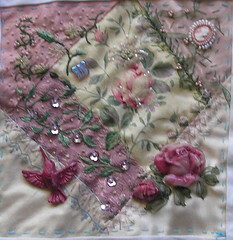 I also added a butterfly motif and complimented it with beading. I'm not one to typically sit down and chronicle.... I just meander around in my head, checking out a myriad of paths and thoughts. I've been working on one though for several days (it originated from reading a blog of another cqer) and decided that its just plain screaming at me to be physically expressed.... SOMEWHERE! So, I chose here! Who knows, might start a new trend for myself! LOL! I am going to refrain from "pointing" to the post of my cyber friend. I don't know all of her story, but I do feel her pain and disappointment. I too have had that experience and am trying to find ways to help deflect further negative experiences from happening if possible. 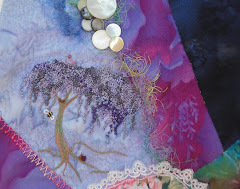 I LOVE crazy quilting!!! It is the best overall way to express EVERYTHING that I am or could be. All kinds of "art" processes are used and many, many more are just coming into being as TONS of creative folks explore textiles and its assorted mediums. There are a bunch of online groups, such as those at Yahoo groups and Quiltropolis, that help support the addictions that go along with this form of creative expression....and within those groups are sub groups of folks that participate in what is called a round robin. What is a round robin? It is an activity where a person creates one or six cq blocks. That block(s) is then mailed to an assigned partner within a group of 5 or 6 people. 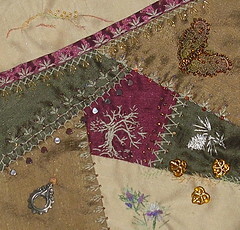 It will be stitched on by that partner, adding stitch variations, embellishments, fibers....whatever "means" they want to decorate their portion of the block. Then the block(s) are moved on to the next person in line. This is a great way to see new ideas and LOTS of creativity. Hand in hand with this, however, comes the occassional problem and disappointment. Not everyone puts the same amount of effort into their work and at times do no more than add a button or two then send it on. The reasons for this could be as simple as they had "life" get in the way, but couldn't find a way to tell anyone about it. Maybe illness, maybe they got overwhelmed seeing all the other work being done or had too much on their plate to really be able to give the block the appropriate attention. This wouldn't be so bad if it weren't for the fact that, that person is very likely to get a wonderfully embellished block back without putting forth any true effort. I don't know where the answer or solution to this problem really lays. I do know that we all are easily distracted and can quickly become overwhelmed with projects because there is SO much out there to learn and experiment with. I would like to encourage (whomever may pass this way) to stop for a moment, before committing to a new swap or round robin and think about everything that has to be done in your world. Maybe you will discover that the timing is just right for that particular rr and you will be able to show your best work and skills. Or... maybe you'll find that there is a little too much going on and need to wait for a different opportunity. Regardless, it is important that we ALL give our very best when sharing with one another so that disappointment or hurt feelings do not occur. Think how you feel when you get your gorgeous block home.... the excitement and wonder it creates! Lets ALL try to give that feeling back! We are, after all, Crazy Quilting Buds!!! This block is for Emiko! The last for this round robin! I really enjoyed working on this block! The colors are so soft and I can almost smell the roses! :_)) wanted to maintain the garden feel of this block so I created some vines over the blocks. I also added some seam variations from TAST (altho i'm waaaaayyyy behind there) and finally added a cameo and created some fimo flowers and a little hummingbird...to show a bit of the US/Colorado for Emiko!!! I hope that she enjoys the block! It was fun working on it!